Mountain biking is a sport which consists of riding bicycles off-road, often over rough terrain,using specially adapted mountain bikes. Mountain bikes share similarities with other bikes, but incorporate features designed to enhance durability and performance in rough terrain. Mountain biking can generally be broken down into multiple categories: cross country(XC), trail riding, all mountain, downhill, freeride, street riding, dirt jumping and trials. The vast majority of mountain biking falls into the recreational XC, and Trail Riding categories. This individual sport requires endurance, core strength and balance, bike handling skills, and self-reliance. XC type mountain biking generally requires a different range of skills and a higher level of fitness than other types of mountain biking. Advanced riders pursue steep technical descents and, in the case of freeriding, downhilling, and dirt jumping, aerial maneuvers off of specially constructed jumps and ramps. Mountain biking can be performed almost anywhere from a back yard to a gravel road, but the majority of mountain bikers ride off-road trails, whether country back roads, fire roads, or singletrack (narrow trails that wind through forests, mountains, deserts, or fields). 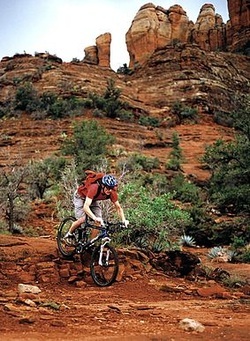 There are aspects of mountain biking that are more similar to trail runningthan regular bicycling. in the case of injury miles from outside help. This reliance on survival skills accounts for the group dynamics of the sport. Club rides and other forms of group rides are common, especially on longer treks. A combination sport named mountain bike orienteering adds the skill of map navigation to mountain biking. mountain trails in Marin County, California. However, it was not until the late1970s and early 1980s that road bicyclecompanies started to manufacture mountain bicycles using high-tech lightweight materials. Specialized introduced the first major production mountain bike in the world, the Stumpjumper, in 1981. Throughout the 1990s and 2000s, mountain biking moved from a little-known sport to a mainstream. terrain. Most modern mountain bikes have front fork or dual suspension, 26 inch and also 29 or 27.5(650b) inch diameter tires, usually from 1.7 to 2.5 inches in width, and a wider, flat or upwardly-rising handlebar that allows a more upright riding position, giving the rider more control. They have a smaller, reinforced frame, usually made of wide tubing. Tires usually have a pronounced lugged tread, and are mounted on rims which are stronger than those used on most non-mountain bicycles. Compared to other bikes, mountain bikes also tend to more frequently use disc brakes. They also tend to have lower ratio gears to facilitate climbing steep hills and traversing obstacles. Pedals vary from simple platform pedals, where the rider simply places the shoes on top of the pedals, to clipless, where the rider uses a specially equipped shoe with a sole that engages mechanically into the pedal. Pedals with toe cages (clips) are rarely used anymore as they take longer to get out of than clipless or platform if one takes a fall on the rough terrain. Generally speaking, enhanced durability and off-road capabilities also result in a heavier bicycle weight to rider ratio than road touring bicycles. bikers often use goggles similar to motorcross or snowboard goggles in unison with their fullface helmets.Shoes generally have gripping soles similar to those of hiking boots for scrambling over un-ridable obstacles, unlike the smooth-bottomed shoes used in road cycling. The shank of mountain bike shoes is generally more flexible than road cycling shoes. Shoes compatible with clipless pedal systems are also frequently used.Clothing is chosen for comfort during physical exertion in the backcountry, and its ability to withstand falls. Road touring clothes are often inappropriate due to their delicate fabrics and construction.Hydration systems are important for mountain bikers in the backcountry, ranging from simple water bottles to water bags with drinking tubes in lightweight backpacks (e.g., Camelbaks). potential obstacles on the trail, experience, technical skill, fitness,perceived risk, desired style and others too numerous to mention. A cross-country helmet and simple long fingered gloves are a good minimum for the majority of riding. alleviating compression and friction, and protection in the event of strikes to the back or palm of the hand or when putting the hand out in a fall. Gloves also protect the hand, fingers, and knuckles from abrasion on rough surfaces such as concrete. Many different styles of gloves exist, with various fits, sizes, finger lengths, palm padding and armor options available. Armoring knuckles and the backs of hands with plastic panels is common in more extreme types of mountainbiking. style and including a jaw guard to protect the face. The weight is the main issue with this type but nowadays they are often relatively well ventilated and made of high-tech materials, such as carbon fiber. As all helmets should meet minimum standards, SNELL B.95 (American Standard) BS EN 1078:1997 (European Standard), DOT or "motorized ratings" are making their way into the market. The choice of helmet often comes down to rider preference, likelihood of crashing and on what features or properties of a helmet they place emphasis. 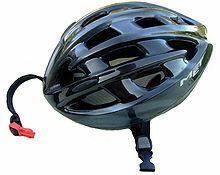 Helmets are mandatory at competitive events and almost without exception at bike parks, most organisations also stipulate when and where full-face helmets must be used. Body armor and pads, often referred to simply as "armor", protect limbs and trunk in the event of a crash. While initially made for and marketed at downhillers, freeriders and jump/street riders, body armor has trickled into other areas of mountain biking as trails have become faster and more technical. Armor ranges from simple neoprene sleeves for knees and elbows to complex, articulated combinations of hard plastic shells and padding that cover a whole limb or the entire body. Some companies market body armor jackets and even full body suits designed to provide greater protection through greater coverage of the body and more secure pad retention. Most upper body protectors also include a spine protector that comprises plastic or metal reinforced plastic plates, over foam padding, which are joined together so that they articulate and move with the back. 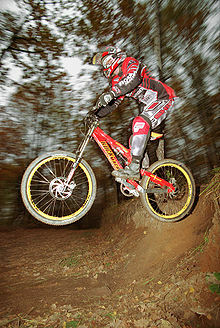 Some mountain bikers also use BMX-style body armor, such as chest plates, abdomen protectors, and spine plates. New technology has seen an influx of integrated neck protectors that fit securely with full face helmets. There is a general correlation between increased protection and increased weight/decreased mobility, although different styles balance these factors differently. Different levels of protection are deemed necessary/desirable by different riders in different circumstances. Backpack hydration systems such as Camelbaks where a water filled bladder is held close to the spine used by some riders for their perceived protective value. However, there is only anecdotal evidence of protection and with the exception of one specific product by the company Deuter, they are never sold as spine protection. people may have to be removed by stretcher, by a motor vehicle suitable for the terrain, or by helicopter.